With Valentine’s Day fast approaching, there will be many sites out there that offer romantic viewing suggestions for you and your special someone. This is not one of those sites. Not in the traditional sense anyway. Just as my first love of literature was science fiction, my film and television soulmate is the end of life as we know it (in its many splendid forms). While we have an open relationship that leaves room for horror and dystopia, the apocalypse knows who I’m coming home to each night. If you’re looking to woo me, the second step is a shared love for all-out disaster. The first step is pancakes, obviously. I was skeptical about this series at first. It’s produced by The Asylum, a company known for such fine cinematic works as Mega Python vs Gatoroid and Sharknado. But it turns out I love seeing the zombie apocalypse through their eyes (incidentally they’ve also produced several zombie movies, including the deliciously cheesy Zombie Apocalypse). Z Nation succeeds in walking the line between horror and humor with only the occasional facepalm moment. There are a few legitimately startling jump scares, creative zombie kills (egg beater!) and honestly some of the most realistic interpersonal relationships I’ve seen in the genre. DJ Qualls, as a lone NSA agent trying to guide survivors from a snow fortress, pulls off the difficult task of acting in isolation. Everyone else in the ensemble cast can play off each other, but even though he speaks with them he’s never in the same room as the rest of the team. And Nat Zang impressed me in his first professional role (also half the teenage internet, judging by all the fanfic out there). It was surprising to me that a show written by two men could do such an amazing job capturing the survival challenges of women. Especially considering how The Walking Dead completely fails at that. I got angry at TWD when I realized that any time a woman started exuding strength or confidence the writers killed her off. But not only is Z Nation full of strong, confident women, it also broaches the subject of these women still having to make different compromises than men in order to survive. The entire first season is now streaming on Netflix, with a second season in the works for later this year. 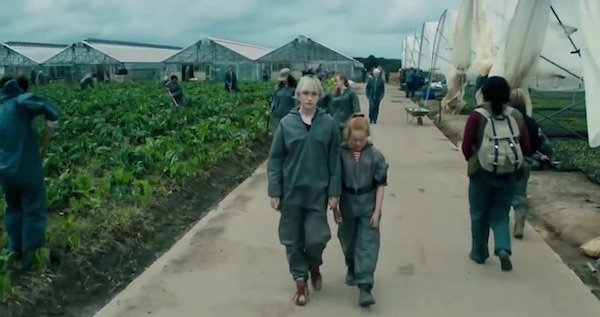 This film (based on the YA novel of the same name) follows a girl named Daisy who goes to England to spend the summer with distant relatives on their farm. While she’s there, World War III breaks out and the kids are forced to fend for themselves sans adults. I haven’t read the book, but my understanding is that the film follows fairly closely to the plot (with just a few creative diversions). One of my favorite elements of the story is that the instigators of the war are referred to as “terrorists,” yet given no description of nationality or religion or mission. You don’t know why they’ve started a war, only that they have. It’s unique in the apocalypse genre in that the kids are mostly left alone to make it through. This is not a Hunger Games dystopia where there are a bunch of adults pulling strings, but there are soldiers who try to enforce some semblance of order. Even with that, it’s a fascinating look at how the primal survival instincts kick in and I think the author masterfully weaves in moral dilemmas. Also, Saoirse Ronan was a perfect casting choice for Daisy. It’s not apocalyptic, per se, but I’m still including this British series on my list. It’s an anthology (so far two “seasons” of three episodes each are available to stream) which means that each episode is a self-contained story. It explores various themes of how society interacts with technology and the often disastrous outcomes. This is hands-down the best show I’ve seen in ages. It’s dark, but not soul-crushingly dark, and has moments of levity as well. The alternative futures that the creators imagine are not so far outside the realm of possibility, and that dose of reality is what really drives the message home. The second episode of the first season (“Fifteen Million Merits,” pictured above) is my favorite – a decidedly sci-fi look at a world of constant stimulation. Rumors are flying that they’re looking to make an American version of the show (much to my dismay) and apparently Robert Downey Jr. bought the rights to one of the episodes looking to turn it into a film (even more to my dismay), so I’d recommend watching the original before someone ruins it for you. Honorable mention for this list goes to Pontypool, for being a zombie-esque film that also takes place on Valentine’s Day. It’s a bit of a slow build, so much so that I found myself getting bored, but the premise (once it eventually gets going) is interesting. Points for creativity, but not much else. I’m always looking for a good disaster to curl up with, so leave your suggestions in the comments!